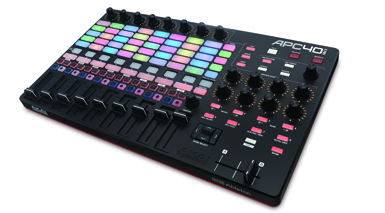 The iconic APC40 Ableton Live controller gets a revamp and gives birth to new offspring. 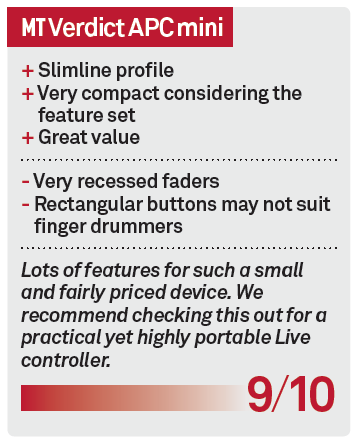 Liam O’Mullane finds out what these have to offer compared with other dedicated Live controllers. 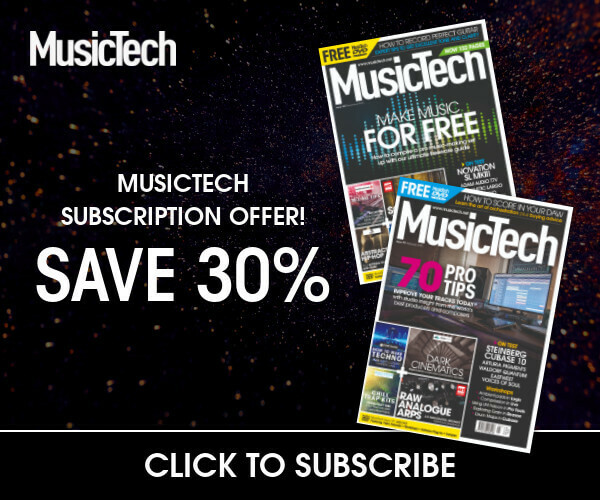 Cast your memory back to early 2009 and you may not have been familiar with the colourful LED grids we are now used to seeing in live electronic and DJ shows. The original APC40, which both Akai and Ableton developed, was the first of its generation of purpose-built Ableton Live controllers that included these clip launching grids. 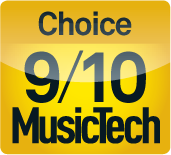 There have since been various competing products released for Live control and each one takes a slightly different angle with their choice of features. The APC40 mkI had nine faders, a crossfader, an 8×5 launch grid and various knobs and buttons to navigate around your session. Still to this day it’s a very good-quality and well thought-out controller, but times have moved on and so have the competition, so the mkII is a welcome update. Two other APC products have also been released around the same time, one being the APC mini, which we’ll also be exploring here. 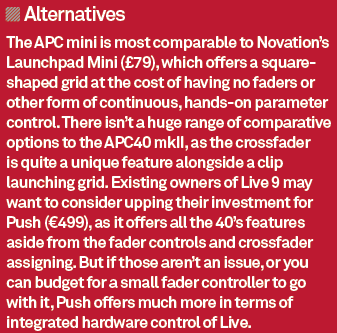 Much like Novation’s response to the APC40 with the Launchpad, the mini seems to be a very similar product, offering an 8×8 grid for more clip access at any one time. Sessions can be navigated to some degree, but as you’d expect for the huge difference in price compared with the APC40 mkII, it offers a lower level of control. But it does have nine low-profile faders, which is generous for the price. 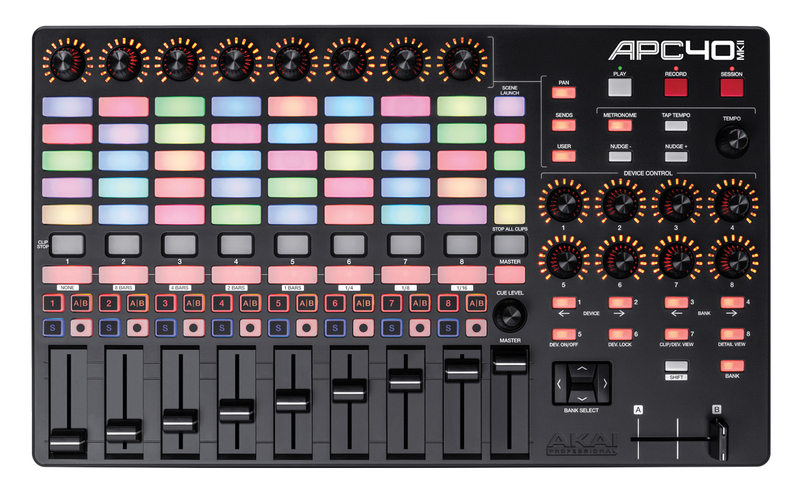 The APC Key 25 is a keyboard variant of the range, and as the name suggests it includes 25 mini keys for more traditional music control, and instead of the mini’s faders it sports eight knobs. Throughout the new range the most noticeable difference to the older APC 40 and APC 20 is the choice to ditch square clip launching pads and maximise space by going rectangular. Though the APC’s never had velocity-sensitive pads we’ve seen quite a few finger drummers using the mkI for performances, so this change in shape may exclude them from these newer products. But the majority of potential users will intend to use the pads for just clip launching, and for that purpose they are perfectly fine. At first glance there are many noticeable differences between the APC40 mkII and the mkI; its rectangular body shape being one of the biggest. This is due to a new, more logical layout of track knobs now being in line with each track. The unit’s height is also now very low-profile, which makes it more bag friendly than the mkI (which also suffered from having easily bendable fader stems). The mkII has rectified this issue by slightly recessing them. 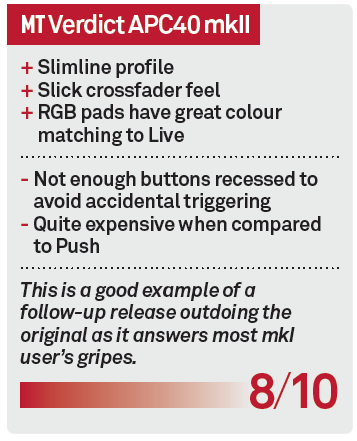 The crossfader feels the same as the mkI with light action and minimal sidewards play for dextrous fader work. Macro and track control knobs are the usual solid build that we expect from Akai but they’ve slightly revised the knob style to a tapered shape. A huge bugbear with the mkI was its requirement to be run off mains power, which is now solved as the mkII is buss powered via USB. 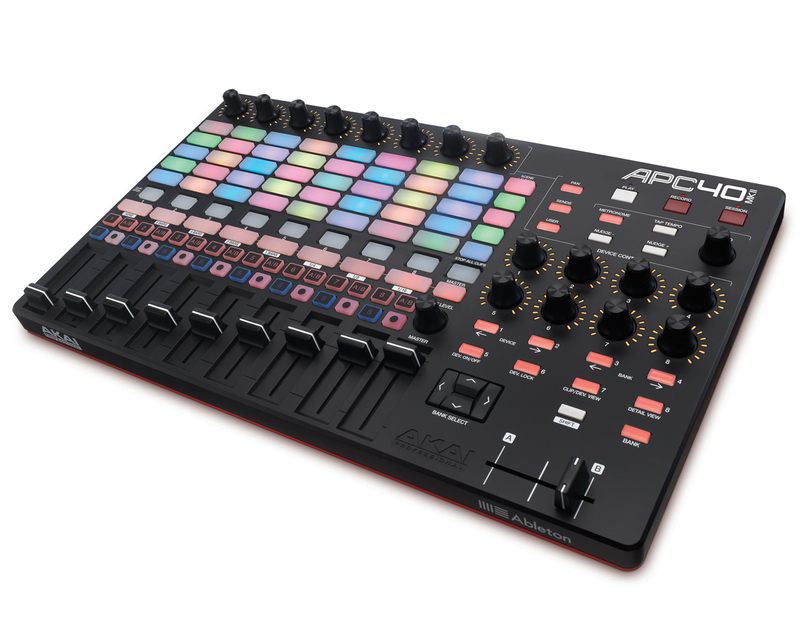 The APC mini’s clip launching grid is much more compact than Novation’s Launchpad, which allows space for the nine faders. 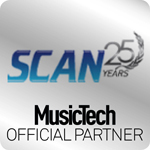 These are a welcome feature as they’re essential for quick channel level access or expressive mapping within Live. They are, however, very short-throw faders and quite recessed, so it’s more of a ‘finger from above to move’ type of situation than a fader you can grab and rag around. But they’re handy nonetheless and not as cheap feeling as other low-profile faders we’ve experienced in the past. Like the APC40 mkII, the whole unit is very low-profile and we can imagine both units could easily fit into a medium-sized laptop bag. Focusing on the APC40 mkII alone there’s some clever revision going on with how Akai has approached the design of certain buttons. Buttons you really don’t want to accidentally trigger in the heat of a gig are recessed, while all other rubberised pads stand proud of the unit for easy access. It’s a shame track arm, cross-fader assignment, track mute and solo buttons aren’t also recessed as they are also undesirable for accidental triggering. Among the revised layout to fit the rectangular body shape, the navigation control to move around Session View is now just above the crossfader for easy access (and while on the topic of easy access the pads now have RGB lighting, which means they mimic different colours and shades to clips in Live). In general, the unit just makes a bit more sense to move around, and the play/stop button for Live’s transport is now on the top of the unit rather than with the mk1 when it was so close to the crossfader that accidental triggering was a potential hazard. The mini doesn’t feature RGB pads but it’s just as easy to work with for launching clips as its bigger brother, even though the pads are smaller. 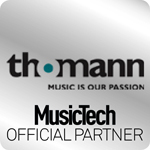 These pads feel just as solid as the APC 40 mkII and shift functionality gives you access to solo, mute, track select and record arm. 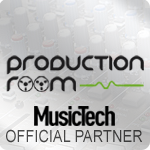 The first eight faders can also move from volume control to pan, send and device control. 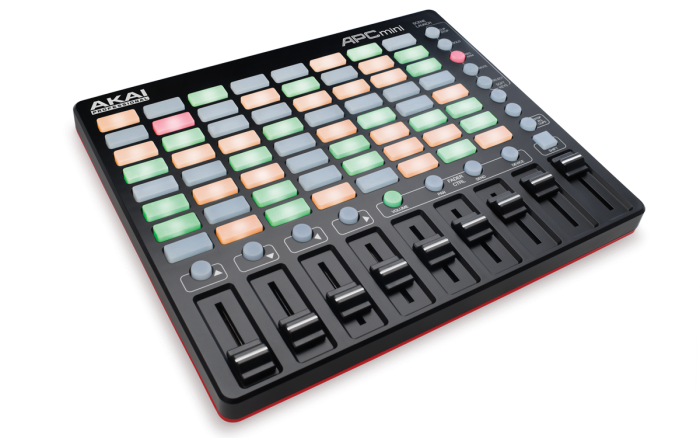 The new APC range is definitely worth considering and may put Akai back on top of the affordable Ableton Live control marketplace. We recommend all APC40 mkI users to check the mkII out, and for those looking at a clip launcher with tactile control at a low price, the mini is also worth a look.